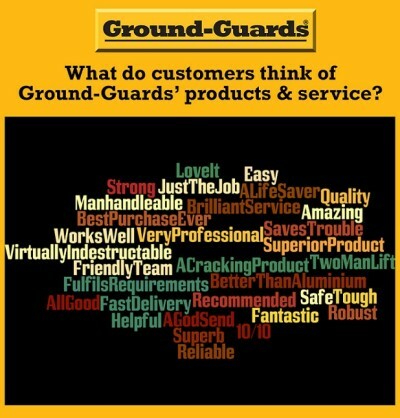 What do customers actually think of Ground-Guards? It’s always pleasing to get positive feedback from customers. We work really hard to give our customers top quality ground protection solutions that fit their individual needs, coupled with a supportive and responsive after-care service. And so when our customers tell us they’re happy, it makes us happy too. Your expectations are the goal that we constantly strive to exceed, by providing you with world-class solutions to your ground protection management needs. We have an enduring passion for what we do, which you will find is evident every time you have contact with us. Our modern, dynamic, forward thinking approach is backed up by the solid experience of serving the ground protection management industry for the past 43 years, since 1969. With a total focus on customer satisfaction, we will work along with you to provide you with simple, cost-effective solutions, on time and within budget…every time. Trust us: your total satisfaction is our number one priority, wherever you are, worldwide.